"This is a great summer pasta salad for barbeques and more. 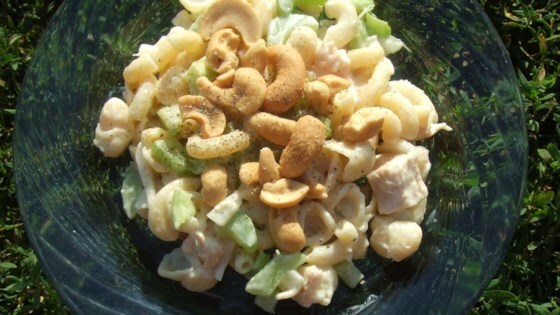 It has a slightly sweet, creamy dressing, and is loaded with chicken, cashews, and crunchy veggies." Bring a large pot of lightly salted water to a boil. Add pasta and cook for 8 to 10 minutes or until al dente; drain and rinse with cold water. In large bowl, combine brown sugar, salad dressing, lemon juice, vinegar and salt. Toss dressing mixture with cooked pasta, celery, green pepper, onion and chicken. Chill until ready to serve. Mix in cashews just before serving. Love this recipe. Second time I made it, I toasted the cashews in a 350 degree oven for 10 minutes so they would stay crunchy in the salad. this was okay. the sauce was indeed sweet the same day, and improved the next day. It didn't get rave reviews from the family. great recipe and easy to make. I took out the celery but added sliced red grapes. The grapes are a great addition to the recipe. Will make again!